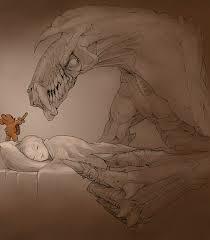 I was surrounded by imaginary friends, well to clarify, all of my stuffed animals were my saviors. They would not save me just from monsters in my room, in the closet, under the bed, in my dreams, but the tree whose branch would tap on my window throughout the night, the shadows guarding the bathroom during the midnight pee run, or the spiders that would try to find a home in the crack in the wall. They put up with the obligatory tea party, the trip to the imaginary doctor getting the crayon shot what wouldn’t wash off, and the tears and snot from being tortured by an older brother; all without complaint. The word ‘friend’ is an understatement; they were my family. If you know who I can credit for this image, please let me know, it captured my heart.